Charles" Chuck" Miklos Sr.- Woody Boater Of The Century. As the current president of the Tidewater ACBS and being Woody Boater I receive around an email a week regarding the passing of folks that were in the hobby of Classic Boating. It’s one of the sad yet real issues facing us squirts that the sole of the hobby is passing on to the big Lake in the sky. It’s not history for these folks, it’s life.. For me and my generation its history, sometimes a romantic version all be it. In many cases though regarding the passings they were active club members or did this or did that. But every now and then, you hear news of a legend going on that long boat ride. And the hobby at that point has lost a bit of its life as well as it living history. If you have not heard. Chuck Miklos passed this weekend. On the way home from a boat show. Now, I must add, that, that is the way to go. Next to your wife, summertime..coming home from a show that you have been going to for years. No accident, just passed at a rest stop where they pulled over. August of 1956 photo. 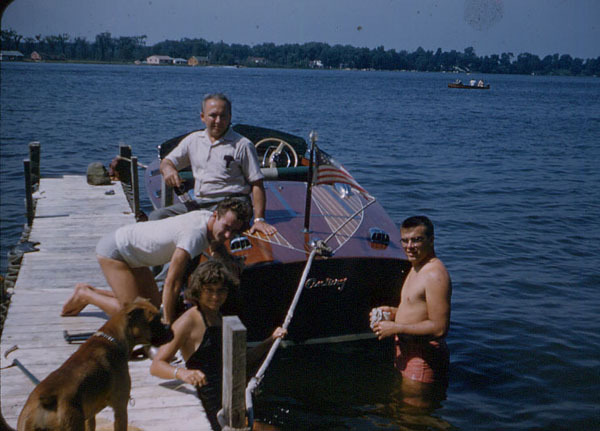 The people in the photo are Charles L. Miklos on the boat, Bernard Ditmore Jr. on the dock, Lois Miklos, (now Snyder), in the water and Chuck Miklos cleaning the boat. The dogs name was Sandy. If you own or lust after a Century Boat. Chances are you have Chuck to thank…Chuck was The Century Boat go to guy. He helped set up the passion of these fine wood boats as a hobby from just boats that get you from point a to point b. .. With over 50 years of doing so.. 50 years.. We are fortunate that he handed down much of his passion to his children. I can and would go on and on. But really the best way to understand him while you are here on the web, is to visit the Miklos & Sons web site. I can not do it justice…Chuck will be missed, the hobby will never be the same. Algonac This Weekend. No Excuses. Be There!!! Yes, It Happened AGAIN! The Harrison's Break Down! It is indeed a sad day in Woody Boaterville. Chuck Miklos, the upholder of the Faith with all things Century. The Miklos website says it all Matt. Hundreds of Century boats bought back to life, nearly all of them surrounded by family growing up through the years as the boats become younger. My Century Cap is off as is my Woody Boater hat.